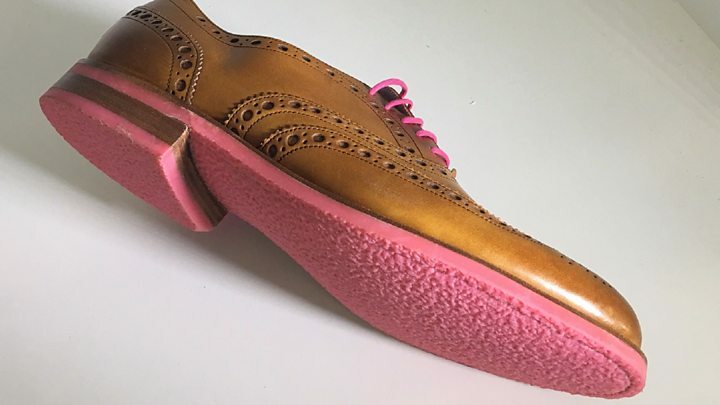 British designer Anna Bullus is on a mission to recycle chewing gum into useful objects, cleaning up our streets in the process. More than £14bn is spent on chewing gum around the world each year, but a lot of that gum will end up stuck to the ground. Gum is the second most common type of street litter after cigarette materials. In the UK, councils spend around £50m each year cleaning up the mess. But Anna had an idea. What if the sticky stuff could actually be recycled and turned into useful objects? Around 10 years ago, she began a project looking at kerbside litter. She examined random samples, looking at things like crisp packets and cigarette butts. She then tried to figure out which elements could be recycled. "One of the litters I found was a piece of chewing gum and as a designer I was completely amazed there was nothing actually being done to recycle it," she said. Researching the chemistry of chewing gum, she discovered that its main ingredient, the gum base, is commonly a synthetic rubber, a type of polymer similar to plastic. "It's called polyisobutylene," explains Anna, "the same stuff you find in the inner tube of bicycle wheels." It is obtained from petrochemicals, which are refined from fossil fuels like crude oil. She realised that chewing gum, even once it has been finished with, is a versatile and potentially useful material. But how do you persuade people to donate their gum - instead of carelessly tossing it on to the street? As part of her strategy, Anna created bright pink, bubble-shaped bins specially for disposing of gum called Gumdrop, which can be hung at head-height. These bins are themselves made of recycled chewing gum. A message next to the bins explains that any gum collected will be recycled into new objects. But would gum-chewers use them? The University of Winchester was one of the first places to sign up to use the bins. Around 8,000 people live and work on its campus and the authorities wanted to keep it clean of gum litter. It adopted a twin-pronged strategy to tackle the problem. It installed 11 of Anna's special bins and to reinforce the message that gum can be recycled if disposed of responsibly, it gave out hundreds of coffee cups made of recycled gum to first-year students. "Students would give the cup a sniff to check it didn't smell of mint or bubble gum," recalls Liz Harris, the university's environmental officer. "It's because so much of the chewing gum sold on the high street is a polymer [so it] can be used to make new products. 'When people get it, it's a really nice moment." Eighteen months later, the university noticed a drop in gum litter and is expanding the scheme. Heathrow Airport also ran a three-month trial which it said led to a "noticeable improvement" and saved it £6,000 in cleaning costs. Great Western Railway has installed the bins in more than 25 of its railway stations and is rolling out the scheme further. In each case, the bins did not suddenly solve the problem of gum litter, but they did seem to begin to change people's behaviour. Another challenge for Anna was to find industrial partners willing to recycle old gum - something completely novel. She eventually persuaded a recycling plant in Worcester to get on board. It takes her bins and filters out unwanted material, like paper or sweet wrappers, before grinding it into pieces and then compounds this with other recycled plastic polymers. The proportion in the mixture varies, but Anna says each object she makes contains a minimum of 20% chewing gum. At a plastic moulding specialist in Leicester called Amber Valley, which normally makes alarm casings, Anna creates her designer objects. Here, the mixture containing the old chewing gum is put into an injection moulding machine. It is heated and then ejected as a paste, which can be moulded into new objects as it cools. "There's no difference [from] the equivalent polypropylene material that it's based against, the processing temperatures and parameters are all identical," says Brett Nixon, a manager at the plant. "When you are handling the finished product, you do take a while to adjust to the fact that this has been in somebody's mouth previously. 'But once you get over that fear it's easy. By recycling it and giving it another lease of life it's helping the environment, it's an absolutely fantastic idea." The UK Parliament has considered imposing taxes on chewing gum companies if they do not do more to combat gum litter. Anna's project has been given financial support from Wrigley, one of the largest manufacturers. It also provides her with surplus material from its Plymouth factory to add to her supply. Alex Hunter-Dunn, a spokesman for Wrigley, explained why the company backs the project. "Gumdrop is a really creative and innovative way to get people responsibly disposing of their gum and binning it. We fundamentally believe that behaviour change is the only long-term sustainable solution to tackle the issue and we are very much behind that." Other approaches are being tried to beat the scourge of gum litter. Researchers have worked on a synthetic chewing gum that is biodegradable and will wash off the streets more easily, which is also the case with an organic chewing gum, made from Chicle gum native to Central America, which has a small market. But in the current market, dominated by synthetic, non-biodegradable gum, Anna thinks her method is the best option on the table. "I do believe that through right design, " she says, "we can actually change the way people behave."